The Boulder County Sheriff’s Office has the second oldest law enforcement canine unit in Colorado, dating back to 1973; the Denver Police Department’s unit is the oldest in the State. The Sheriff’s Office has five canine teams, four of which specialize in both detection and patrol work. Three dogs are trained to detect illegal drugs and one is trained to detect explosives. We also have one bloodhound whose sole purpose is tracking. Deputies and their dogs are routinely assigned a patrol district, but may respond anywhere in the County to provide assistance as needed. The teams are subject to call-out 24 hours a day, 365 days a year. The canines are either purchased by the Sheriff’s Office or donated by a citizen. Each dog is assigned to a specific deputy and lives with that deputy and his/her family. A dog’s working career typically spans four to six years. Following retirement, the dog may be given to their handler and becomes a family pet. The entire Sheriff’s K-9 Unit trains together, committing approximately 30 hours each month for the period that they are in active service. Additionally, each handler is expected to conduct training with his/her assigned dog while on duty. Our four patrol/detection teams certify annually to standards established by the Colorado Police Canine Association (CPCA). These standards emphasize obedience, agility, article/evidence detection, criminal apprehension, and handler protection in addition to demonstrating proficiency in their detection specialty (drugs or explosives). All dogs have a drive to find prey as part of their survival instinct. Some breeds are better at finding prey with their noses. We train our K-9s to locate narcotics and explosives by scent alone. This is accomplished by using the game of fetch to trigger the dog’s natural retrieval drives. Narcotics and explosives are hidden in a toy and the toy is hidden where the dog has to use their nose to detect it. Through repetition, the dog associates the scent of the narcotic or explosive with the toy. When the canine is deployed on a narcotic or explosive search, they believe they are looking for their toy hidden in the suspect’s car, clothing, or personal effects. Our program has added “decoy” positions to our training. Suitably equipped volunteers play the role of the aggressor, hiding and running from the dog, and taking “hits” (bites). The decoy (known familiarly as “the human chew toy”), helps to build a dog’s apprehension skills and provides practical training for both the handler and the dog. This is by far the most physically demanding position within the Unit. If you would like to help the non-profit Friends of Boulder County Sheriff K9 Association (bcsk9.org), you can donate money and receive these fuzzy little guys that represent our current K9 unit. The association is asking for a $20 donation for one stuffed dog or a $100 donation for all 6 stuffed dogs. 50% of the proceeds goes directly to the organization, which supports the retirement of our K9 partners, the other 50% will go towards the purchase of more stuffed dogs to help continue this fundraiser. 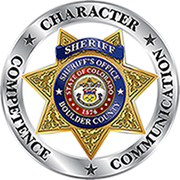 Donations and pick-up of the K9 stuffed dogs can be made at the Boulder County Sheriff’s Office Headquarters, located at: 5600 Flatiron Parkway, Boulder. Checkout which Canine (K-9) Breeds are used and our Retired K-9s.